Tranquility Ridge is a spacious, well apportioned, and super private cabin that is awaiting your next family's vacation, or the perfect couples getaway retreat. This amazing property is located some at the dead end of a driveway that will have no neighbors in sight, so privacy at this property is second to none. The property boasts three levels of living space and three levels of covered porches for outside enjoyment. One visit to this property and you will be hooked for many many more stays in the future. Upon arriving at the property you will enter the house thru the oversized screened in porch, with a towering floor to ceiling wood burning fireplace. Once inside the house you will feel the oversized living spaces with tall ceilings. This property, featuring a prow front, makes for a much larger foot print and living area. The kitchen is open to the living room and dining room, creating a great flow and the ability to entertain and cook all at the same time. Tranquity Ridge is located in the north and eastern side of the Blue Ridge, GA in the Mineral Bluff area. Travel from Blue Ridge North on HWY. 60, passing the popular Lake Blue Ridge and Toccoa River, to a tucked away property off a small gravel road, with an awesome mountain view to enjoy. The cabin is about 12-14 minutes from the town of Blue Ridge, though not that many miles away. 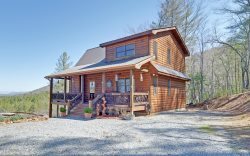 The property is very close to Lake Blue Ridge, the Toccoa River, the Ocoee River for White Water Rafting, Zip Lining, and many other unique outdoor action and adventure locations. This property is at the dead end of a road, so no neighbors to be seen, and no cars passing by, creating ultimate privacy. Excellent service. Very easy to rent. Easy check in. Loved it so much. Beautiful cabin. Everything needed for an excellent rental. John Seabolt was wonderful! He was very kind and knowledgeable in answering all of our questions! Friendly, friendly, service. Everything went according to plan! No complaints what so ever! I did a lot of research when we decided we wanted a vacation in the GA mountains...a lot!!! I looked at many, many, cabins with different rental companies. Georgia Mountain Cabin Rentals had the type of cabin we were looking for, prow front, in the price range we wanted, with the best deposit and discounts! This was our first cabin rental, so we were a bit nervous about the whole process...we couldn't have been happier with Georgia Mountain Cabin Rentals, our cabin, and the whole experience!! It was the BEST! We loved Tranquility Ridge and hope to stay longer next time. There will be no need to look for a different cabin rental as Tranquility Ridge met all of our needs, and then some! It was the BEST! We loved the size of the cabin, the gorgeous sunsets, the fireplaces! It was spacious and full of light with lots of windows to take in the beautiful mountain views! We enjoyed all the amenities...the pool table, dart game, hot tub! Everyone we spoke with was very friendly and helpful and Amber was especially helpful with recommendations of local restaurants and venues. We loved our stay in the property as well as how easy the whole process was. We are already making plans for a rental again this year but this time we are bringing the rest of the family with us. We will definitely be using Georgia Mountain Cabin Rentals again. This was our first cabin rental experience and we were looking for a secluded cabin. Tranquility Ridge was not only secluded but offered beautiful views both day and night. It has been months since our visit and we are still talking about the views and our stay here. The stay at the cabin was great! Beautiful place and very comfortable. Screened deck with fireplace was my favorite spot. Master bedroom on top floor had no real separation from bedroom and bathroom. The view was pretty but a little less than what I expected. If you want a perfectly relaxing, calming, and worry free stay, use this company and rental properties! You wont be disappointed ! GMCR was very polite and responsive. No complaints about our experience. We like the ease of renting cabins with GMCR. WEve done so twice and find their reservation, check in, and check out procedures to be very efficient. Likewise, the cabins are always very nice and good value. We had a great vacation at Tranquility Ridge. This was our third trip to Blue Ridge and our second time renting a cabin with GMCR. We love this area and the cabins are always perfect for a great family vacation. We sought a relaxing, spacious, and well appointed cabin for a week-long family vacation. This cabin was very clean, with very nice furnishings, and provided the ideal setting for some serious R&R. What a great anniversary weekend! My second time staying. Just like the first time, we had an amazing time. This looks to be the beginning of a family tradition. Awesome experience. Great check in and check out process. Would like others to experience what I had the pleasure of sharing with my family. Everyone was very easy to work with. The stay was perfect and I would do it again. Team is very friendly and welcoming, mush better than we have experienced with other rental company's. Kept it smooth and simple! Truly amazing, so sad to leave this beautiful place but we will definitely return soon! Thanks to the owners for sharing their home. Such a pleasure to work with everyone I spoke to. From the moment I called, I was told about specials and promotions and all that was available for my group to do. We really had a great time, and have already began planning our trip back! Everyone at the office was very nice and welcoming. Beautiful property and wonderful view! It was excellent....we did not want to leave and can't wait to come back again. We have rented cabins from Georgia Mountain Cabin Rentals for many years and will continue to return. The cabins have everything one needs to have a wonderful and relaxing time. They are charming and well maintained. The mountain views are outstanding.